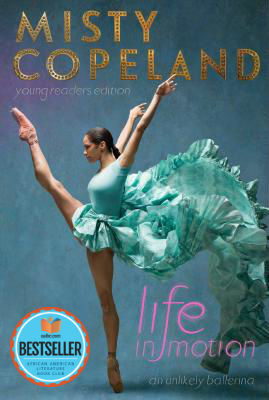 Determination meets dance in this middle grade adaptation of the New York Times bestselling memoir by the first female African-American principal dancer in American Ballet Theatre history, Misty Copeland. As the first female African-American principal dancer at the American Ballet Theatre, Misty Copeland has been breaking down all kinds of barriers in the world of dance. But when she first started dancing—at the late age of thirteen—no one would have guessed the shy, underprivileged girl would one day make history in her field. Her road to excellence was not easy—a chaotic home life, with several siblings and a single mother, was a stark contrast to the control and comfort she found on stage. And when her home life and incredible dance promise begin to clash, Misty had to learn to stand up for herself and navigate complex relationships with her family and the dance world, while pursuing her ballet dreams. Life in Motion is a story for all the kids who dare to be different, dream bigger, and aspire to break stereotypes in whatever they do. Tell us what do you think about Life in Motion: An Unlikely Ballerina Young Readers Edition.